Some casual Harley Quinn style? Not a bad idea! You yourself might be a Harley Quinn admirer, or you might even be a player on the supervillain scene. Either way, when you're getting dressed up for a little old crime spree, you're going to have to get your costume just right. Whether you're in a classic Harlequin jumper or even just picking out your favorite shorts and Daddy's Lil Monster t-shirt, we think there's something you definitely need to have in your bad girl fashion repertoire. 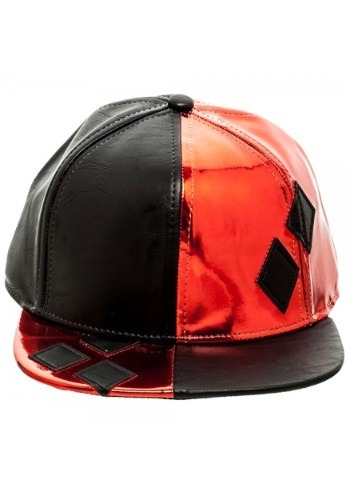 This Harley Quinn Villain Snapback Hat! This Harley Quinn snapback ball cap is DC Comics officially licensed. It's sized for women, and has an adjustable plastic size adjustment band in the back to get the perfect fit. It's made of PU leather, with split black and red panels. The red panels have a metallic shiny finish and have appliqued diamonds on them. But we're sure you're not always set to get dressed up every single time you step out the front door. After all, dressing up as a supervillain is a ton of work! This snapback hat works perfectly great as an outfit accent, too, to show off your wicked side with any old thing you decide to wear. So, just pop on this Harley Quinn Villain Snapback Hat, and you'll have her signature style ready to hit the town!